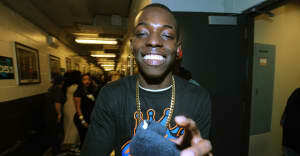 Alex “A-Rod” Crandon and Rashid “Rasha” Derissant—two of the young men who were arrested alongside Bobby Shmurda during the December 2014 sweep of Quad Studios in New York—have been convicted on a number of charges, including murder, attempted murder, and conspiracy. These convictions could very well amount to a lifetime in prison for Crandon and Derissant. “As indicated by their verdict, the jurors in this trial heard evidence describing a cold blooded murder, wild gunplay and a terrifying disregard for the safety of innocent bystanders as the defendants tried to violently settle scores with rivals in New York City and beyond,” Wrote Special Narcotics Prosecutor Bridget G. Brennan in a release addressing the conviction, which can be read in full here. Reached by phone, Special Narcotics Prosecutor Bridget G. Brennan declined to comment on what these convictions might mean for Shmurda.